It’s a beautiful, sunny, chilly morning here in Vancouver. I’m feeling good because for the first time in about two weeks I slept in past 7! I had my alarm set for 6:20 so I could make it to a 7:00 spin class but today my body just said NO so I decided to listen. I’ve got a week full of early mornings so I wanted to take advantage of my option to have an 8:30 sleep in today. Now I don’t know about you, but I resonate Mondays with the day to “get back on track”. When I was just beginning my healthy journey I would eat fairly well throughout the week, then on the weekend it would be cases of beer, hot dogs or nachos from 7-11, and a big greasy breakfast to nurse my hangover before doing it all over again. While my weekend habits are substantially less destructive these days, I find I still struggle with weekends a little bit. Saturdays are always a crazy day for me with anywhere from 2-4 hours of training before heading to work for an 8 hour shift. I snack on energy bars and balls when I can, but I know I’m not getting all the nutrients my body needs for the first 6 or so hours of my day. Sunday is grocery shopping day so I’m usually out of food by this point and often rely on smoothies for the rest of my nutrition. Sundays are my day off and usually include at least one meal out and grazing throughout the day without really paying attention to my hunger and fullness signals. Saturdays there is too much structure, and Sunday there isn’t enough. Step 1 – Lose the guilt. It’s natural to feel disappointed in yourself after a weekend binge. We see these “motivational” pictures all over social media with ripped, sweaty bodies saying things like “Team No Days Off” or “Every Damn Day”. Ignore these fitspo photos and forgive yourself. You’re human! You’re allowed to slip up! While we DO have the power to control what we eat, the companies who make chips and cookies and things we tend to binge on do a REAL good job at making it difficult to stop at just one or a couple. Be honest with yourself about your slip-ups, and then move on. Don’t put the blame on anyone – not the chip companies, not your partner, not yourself. What’s done is done, so it’s time to move on. Step 2 – Stay off the scale for at least three days. Tempted to step on that scale the morning after a binge to see how much “damage” you did? DON’T DO IT! That number is most likely going to be higher, and it’s most likely going to put you in an unhealthy mindset. It takes an excess of 3500 calories to gain one pound. Let’s say your body burns about 1400 calories in a typical day. You would need to consume 4900 in a day to gain a pound overnight. When the number on the scale is two or even three pounds higher than it was a couple of days before, this is likely due to water retention. As our bodies store glycogen from carbohydrates they also store water. 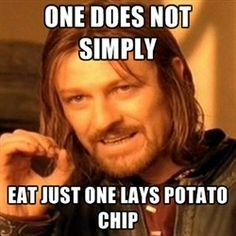 And eating foods that are high in sodium, like potato chips and other processed foods, also causes water retention. So stay off the scale, drink lots of water, and sweat. After three days if you want to get back on the scale then go for it. Step 3 – Don’t cut calories to compensate for the weekend. Maybe you didn’t heed my advice in Step 2 and got on the scale, saw FIVE more pounds than you did last time, and are now feeling the need to “make up” for the weekend by eating less through the week. I need to punish myself for eating crap all weekend by working out twice a day and eating nothing but chicken and vegetables for the rest of the week! Noooooooooo. No. No. No and a big resounding NO. 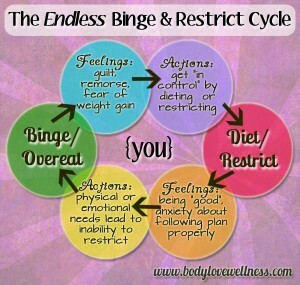 This creates an unhealthy binge-restrict cycle. If you get super strict with yourself during the week you’ll be that much more likely to binge again on the weekend. And so the cycle continues. This is disordered eating! I wrote a post last year about Binge Eating Disorder which you can read here. Recovering from the damage done by an unhealthy long-term relationship with food will take a lot longer than bouncing back from a weekend binge the sensible way, so avoid going down that road at all costs. 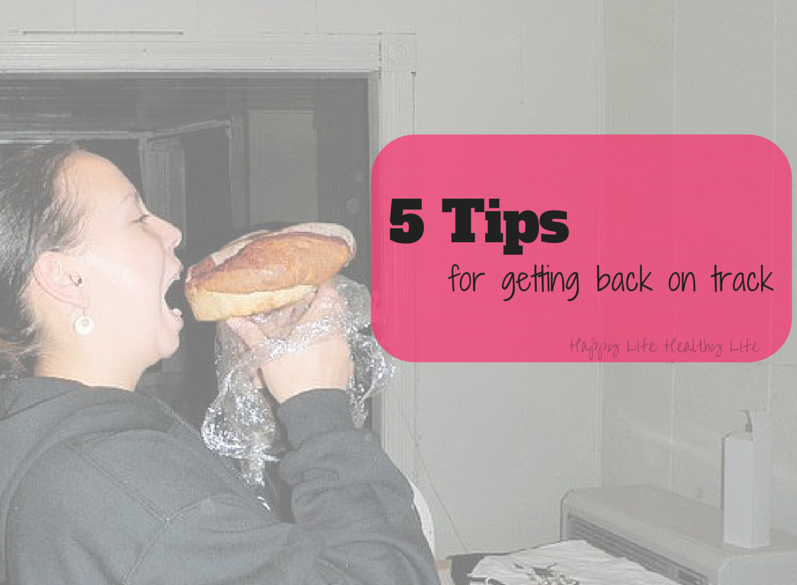 Step 4 – Pick right back up where you left off. If you were on the right track before, you already know what you need to do. You need to go out, buy your healthy groceries, plan and prepare some healthy meals, and just do the damn thing. Don’t over-complicate things and don’t lose sight of the accomplishments you’ve already made, whether you’ve lost 20 pounds or whether you’ve had one or two successful meal preps. By this point you should have lost your feelings of guilt and you have decided to not go the calorie-cutting route for the week, so this shouldn’t be difficult! Forget about the weekend and just keep pushing forward. Step 5 – Create a plan of attack. If you have no problem meal planning and prepping for the week but find your weekend eating habits to be less than stellar, make a plan Thursday evening and pick up a few groceries on your way home on Friday night. Try to maintain some structure in your weekend. If you typically have your meals planned out to a T during the week, do it for the weekend as well! If you find yourself grazing throughout the weekend like I do, find things to keep yourself busy with. Go shopping with a friend and enjoy a nice lunch out. Go for a long walk, hike or bike ride. Help a family member with a project around the house that will keep you busy. The weekend is definitely a time for relaxing and socializing, and a balanced relationship with food will of course include dining out or an indulgent meal here and there, but the weekend does not have to be solely focused around food and drink. It can take time to completely change your relationship with food. It’s something I’m still working on. But by employing these tips you can speed up the process! What do you do after having an off-day or an off-week? Do you get right back on track, or do you struggle to find the motivation to do so? Do you have any tactics you’d like to share? I’d love to hear them! 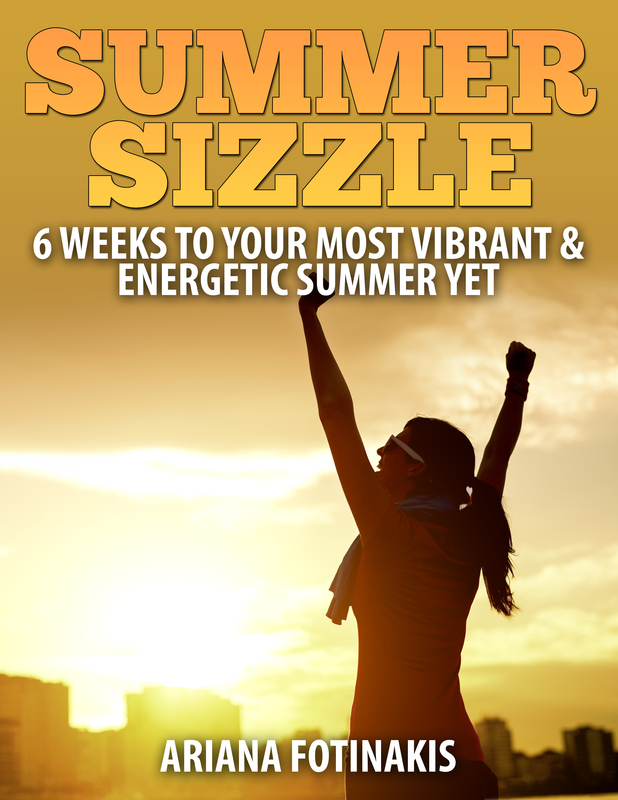 This entry was posted in Health, Wellness and tagged balance, clean eating, diet, eating disorders, exercise, food, health, healthy-living, inspiration, nutrition, sweat pink, vancouver, weight loss, wellness. Bookmark the permalink. Great tips! I think the first one is the best – it’s best to lose the guilt and pick up where you started from! It’s a tough one for sure, but I think it helps make the other steps easier! I’m laying here in my wagon ruts. I just wrote about my weekend. I’m back up an at it. No guilt, no worries. Just 20 more pounds! Good for you! Getting started again can be one of the hardest parts, but it sounds like you’ve got a great attitude about it! These are great tips that I hadn’t really thought of trying. This is the time of year where it’s really hard to fall off the wagon, so this is great timing for this post! Thanks for sharing! The guilt and binge cycle was HUGE for me! I’ve only gotten back on track in the last three weeks and it was a good 8 months of crappy disordered eating (while training for an Ironman). Not a good combo. Oh wow, good for you though! Eating for performance is sooo different than eating for weight loss or maintenance and it’s something that I still occasionally have an odd mindset about. Great tips!!! I try to make sure I have a cheat day (or two) each week. I usually feel bad about it afterwards and helps me stick to the plan. Good tactic! I find whenever I go overboard on food that makes me feel crappy it’s more motivation to stay away from it in the future. These were GREAT tips! I love “Losing the Guilt”! We all need a dose of that!!! Thanks!!! I’m glad you found them helpful! Thanks for stopping by! I agree. I think when we attach that “cheat day” mentality thing we tend to go overboard. I used to call it “Eat Whatever I Want Sunday” and it usually just resulted in me feeling gross.